But at heart the show is a campy romp. Loosely adapted from Sir Philip Sidney’s Elizabethan prose adventure Arcadia, the musical spins a complicated tale of romance, lust, intrigue and cross-dressing. (Its original book, by Avenue Q’s Jeff Whitty, was extensively rewritten by James Magruder.) Stubborn Basilius (Jeremy Kushnier) and his frustrated queen, Gynecia (a smashing Rachel York), rule a kingdom blessed by “the beat,” a divine gift that keeps their realm in a happy groove. Their beautiful but vain daughter Pamela (the big-bodied and big-voiced Bonnie Milligan, in a triumphant Broadway debut) refuses to marry; her overshadowed sister, Philoclea (the affecting Alexandra Socha), is courted by a passionate shepherd, Musidorus (played with fine comic sinew by Andrew Durand). After an ominous warning by the new Oracle of Delphi (RuPaul’s Drag Race alumna Peppermint), they all tramp off on a voyage of discovery, trailed by loyal servants (Tom Alan Robbins and Taylor Iman Jones) and by Musidorus, disguised as a sexually irresistible Amazon. 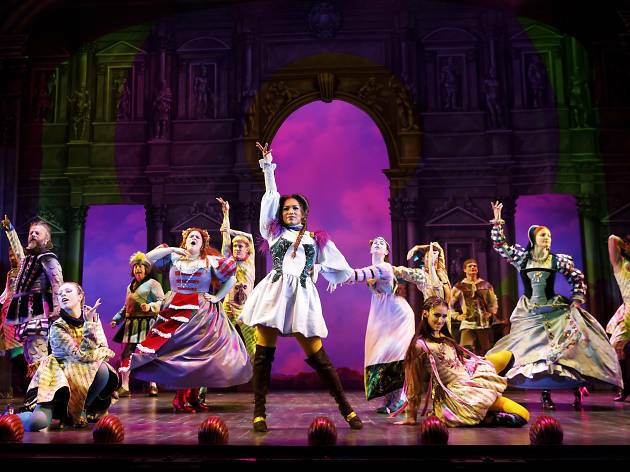 There is only so deep a Go-Go’s musical can go, and director Michael Mayer keeps the surface glimmering—with help from a chorus of eight courtiers, who execute Spencer Liff’s swift, sassy choreography in imaginative costumes by Arianne Phillips. Broadway traditionalists may not approve, but that feels like part of the point. 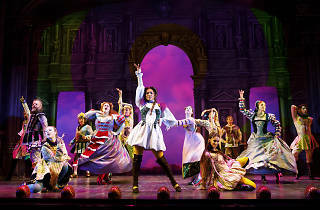 Head Over Heels is a fantasy and celebration of nonconformity, and it puts its casting where its mouth is with an ensemble that is diverse in race, gender and size. Honoring the beat, in this merry Arcadia, means making room for different drummers. Hudson Theatre (Broadway). Music and lyrics by the Go-Go’s. Conceived and original book by Jeff Whitty. Adapted by James Magruder. Directed by Michael Mayer. With ensemble cast. Running time: 2hrs 15mins. One intermission.